Internship training can be as competitive as getting into a good college or university and you will have to submit an application that will make you stand out from the many others applying. Your statement of purpose for internship is a vital part of this as they will want to find out who you are as a person rather than simply look at a list of grades to make their selections. Looking at our examples of statement of purpose writing you will see the standard that will be required of your application. Your SoP for research internship needs to be written in a way that will make you appear as the best possible fit for the program. It needs to be carefully tailored to their internship so that it is clear and obvious that you are a great selection. Anything less and you simply will be overlooked and not invited for an interview. What Should You Consider When Writing Your Statement of Purpose for Internship? Remember always that you will need to show the people reviewing your internship statement of purpose or your SoP for Masters in engineering just what they are looking for. This is why looking for a statement of purpose for internship sample for your application can be so important. A good SoP for internship example will show you just the areas that you will need to consider covering within your writing. However, SoP samples for internship will only ever be part of the story. Every internship will have their own very specific expectations and requirements and you must understand what they are before you start your writing. It is not going to work if you write a generic statement of purpose and then use that to apply to everywhere. If you want to be a success then you need to tailor what you are writing with care to the specific internship you are applying to. How Should You Structure Your SoP for Internship? Your opening should clearly introduce who you are and what you are applying to with your statement. It should also highlight anything special about you that may help you to stand out such as being a member of a minority or an unusual experience. It should also introduce your reasons for wanting to follow the specific subject area or career path that you are taking. What is inspiring you to go into research; is there a specific experience you have had or are you inspired by someone in particular? What past experience do you have with research? This can cover fieldwork, classroom experience, and past internships. What specific skills do you have that will benefit the research internship such as equipment operation, use of statistical software, or critical thinking skills. How does their research relate to your own future educational and career plans? Current Interests: What are you currently interested in studying and why? How does this internship fit with your current interests and why? Explain your longer-term career goals, usually for the next 5 to 10 years. Explain how the internship is a vital step in achieving your career goals. Demonstrate that this is a necessary and vital part of your current training and education. This needs to show that you have done your research and fully understand just what you will be doing as an intern. What is it about the internship that you are most looking forward to? What do you hope to learn from it? Who do you hope to be working with? Be as specific as possible to show that you have a real interest in what they have to offer. Do not simply summarize what you have already said. Tie everything together and show how you and they will really benefit from accepting you onto the internship. Do your homework and read up on the internship that you are aiming for. The better that you understand what they want to see the more chance you have of being successful. Tailor your application to the specific internship: do not try to use one SoP for multiple applications as it simply will lack the focus required to get their attention. Take a good look at a statement of purpose sample for internship for writing guidance. 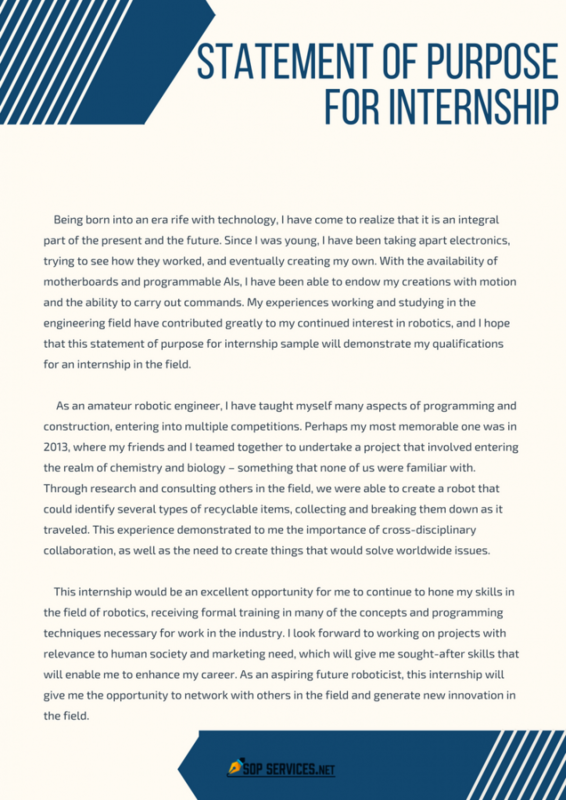 However, do not simply copy the first SoP for summer internship in engineering sample that you see as this will simply not reflect you or target the position you are applying to. Get a theme for your statement of purpose internship: use an anecdote to create your opening and give you something to relate back to within your conclusion. A good story will always be more effective than a simple list of facts about you. Make your opening count: they will probably be reading many statements so you need yours to get their attention right from the opening line. It must make them want to know who you are and what else you are going to have to say. Avoid all clichés and any copying: they want to read something that is unique and totally in your own words from start to finish. Keep your internship SoP writing concise: your statement is rarely more than a page in length and you will need to make sure that you make every single word that you use count. Be personal: this is about you and you need them to fully understand just what it is that drives you and motivates you towards your future goals. Be honest: don’t simply write what you think they want to hear. Ensure that you reflect your own personal motivations and ambitions. After all, they may want to interview you and review all that you have written. Check your statement of purpose with great care: simple spelling mistakes or grammatical errors should all be avoided as they will simply tell the reader that you did not care enough about the application to correct your writing. 1st Paragraph or Introduction: Give your reasons for wanting to follow your field of study and employment. 2nd Paragraph: show your research experience, what skills you have learned, and what areas you would like to research in the future. 3rd Paragraph: explain the skills that you have and why they make you suited to work and research in this area. 4th Paragraph: tell them what you hope to gain from their internship and what specifically you will contribute to it. 5th Paragraph, conclusion: summarize and relate it to your own future career goals. Why Work with Our Statement of Purpose Internship Writers? Whether you need a sample SoP for internship to review or a referral letter to add to your application, our statement of purpose writing service is here to help you. We know just how to make an effective application that is going to help you to gain your goals. With our support, you gain an immediate edge over your competitors as we will know just how your statement of purpose internship and other documentation needs to be written for it to be effective. Direct access to a writing or editing expert that has many years of experience as well as a postgraduate degree in an area that will be relevant to your application. Fully confidential support: our services do not share your information or the writing that is done for you. Fully original writing: work is performed with you and without any copying or rewriting of any kind. Your totally unique internship SoP is tailored to your application and supplied to you with a plagiarism report. Very affordable: we detail out our prices clearly within our website and there are never any additional charges that you will be expected to pay. Free proofreading of your SoP: we ensure that all work is free from any errors through our fully certified and effective proofreaders. Guaranteed satisfaction with your internship SoP or we will provide you with a full refund. Work with our experts today to ensure that your highly effective statement of purpose for internship will get you noticed!